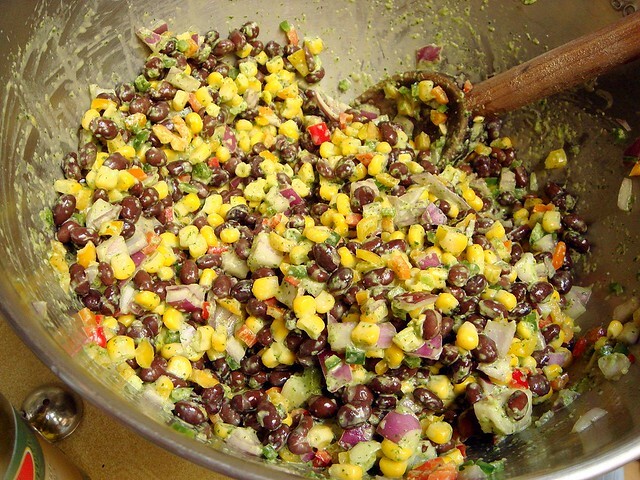 One of my favorite salads (or side dish, rather) is this fresh black bean and corn salad. There are many different versions out there and this one is mine. It pairs well with fish, chicken, steak, or solo and I have yet to meet the person who does not like it (not that I would be friends with the person who refuses to see how great this dish is). I said "fresh", though you'll notice I have a bag of frozen corn. I normally slice corn off the cob, and I feel the milkiness of the fresh corn adds a lot to this recipe, though I had tons of bags of frozen corn in the freezer and it saved me from buying an additional ingredient. Besides, frozen vegetables are actually fresher than their canned counterparts, so the texture wasn't much different compared to corn on the cob. 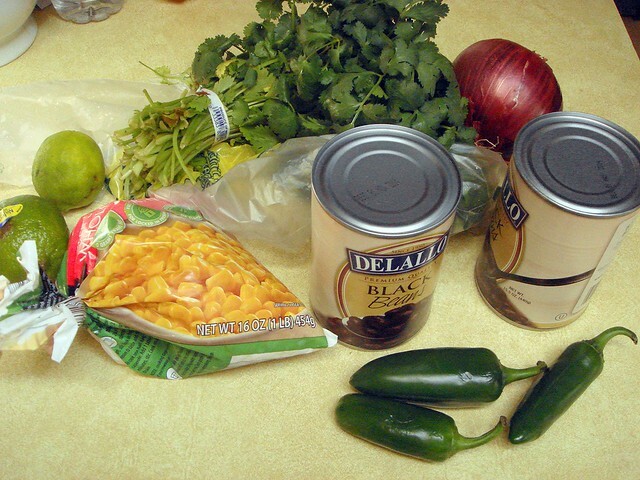 Aside from the corn, the other ingredients are canned black beans, mini peppers, jalapenos, red onion, and the cilantro vinaigrette. Usually, I just toss everything with fresh lime juice, olive oil, chopped cilantro, minced garlic, and a little salt, but this time I created this versatile vinaigrette. 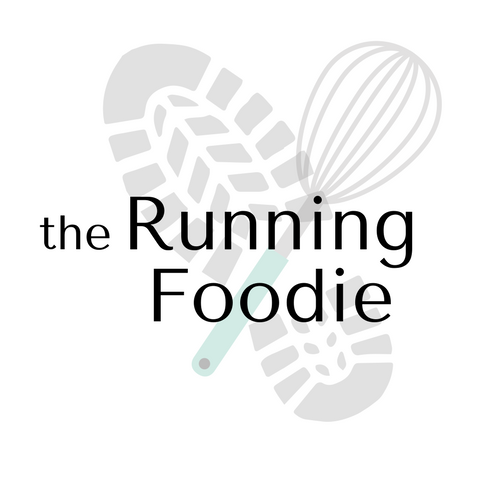 I have no doubt that this recipe can be used like a chimichurri sauce (which contains parsley) on meat, fish, or on salads. It's pretty good, and tasted better the longer it rested. 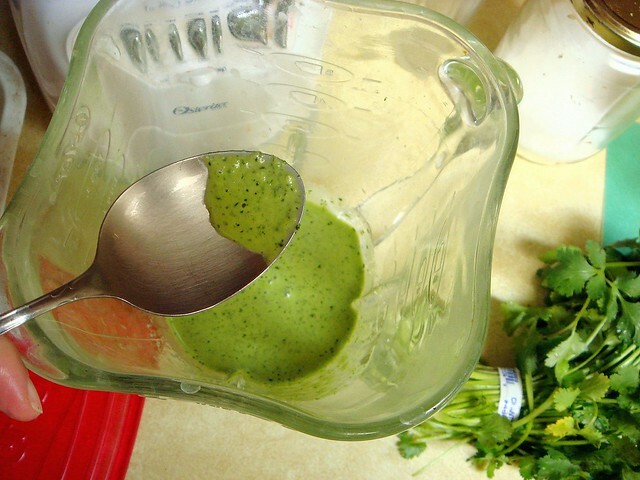 In the vinaigrette was cilantro, half the jalapenos, garlic, fresh lime juice, and olive oil, blended until the everything emulsified into a smooth green sauce. I thinned it out with a little water, then poured it over the salad. The only downside to this recipe is that once you make it, you will have to keep making it forever. I hope you can live with that. 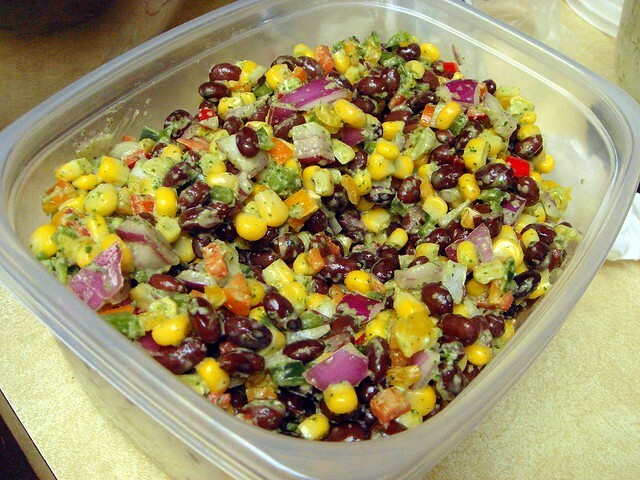 In a large mixing bowl, combine the black beans, corn, peppers, jalapenos, and red onion. 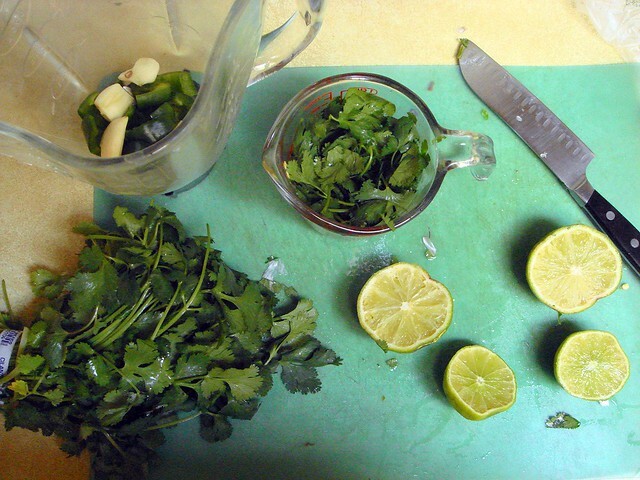 Place the cilantro, garlic, jalapenos, olive oil, lime juice, and salt in a blender. Puree until smooth, adding tablespoons of water if needed. 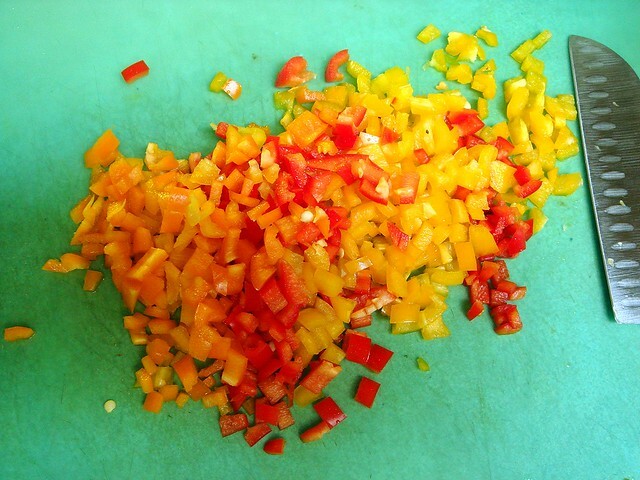 If the vinaigrette is too thick, thin it out with more of the water, aiming for a thick, pourable consistency. 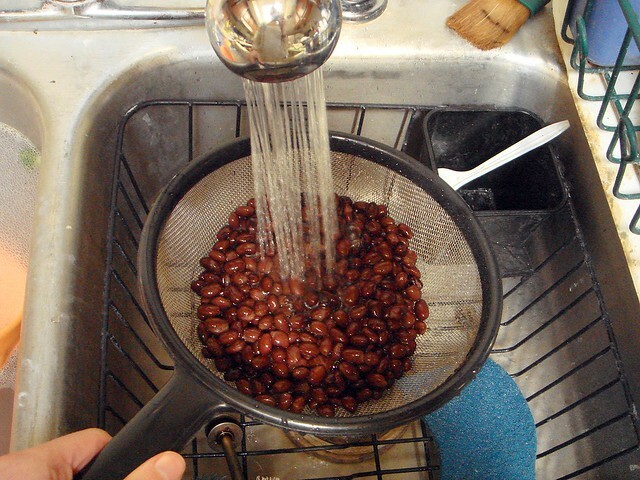 Pour vinaigrette over black beans, tossing to coat. Refrigerate an hour or more prior to serving. Serve chilled. Yes, yes, yes! Would you believe I had something like this tonight? I did mixed greens with corn, jalapeno, black beans, pineaple and goat cheese. Your salad looks better though. I want some. Emily, I do believe because I know that most people have tried this! I like the idea of pairing it with fruit. I put mangoes in this salad one time. I love Aldi. And your smilies are just fine, haha. My husband and I love this salad! We're doing the Insanity workout DVDs for 2 months and have been trying other proteins. This was very flavorful and satisfying. Thanks for sharing! I'm glad you both liked it! Keep up the good work with Insanity. Thanks! I am certainly seeing results after 3 weeks. And you're right, I cannot stop making this salad. Making it right now to share at a beach party tomorrow. It's perfect as it's cold and refreshing (not to mention nourishing!). I do add 3/4 c. of celery to add some green.